It’s a stubborn and slightly unfashionable thing to say, but I continue to believe there will be Labour MPs in Scotland after 7 May. And not just one or two. I think the party has a good chance of holding on to maybe a quarter of the seats it won in 2010 – in other words, a minimum of around 10. But there are 59 seats in Scotland and every one is different. Will 45-50% of people in each of these seats all vote for the SNP? Or is that 45-50% poll figure spread unevenly across the nation? I have to tend towards the latter view, if for no other reason than it it is safer. It might be over-cautious, but when you’re dealing with something that has no precedent, it also seems shrewd. Lord Ashcroft’s polls have rightly made headlines, but as yet he’s been to only 28 of the 59 constituencies. A few polls have been within the margin of error. As the man himself always says, he deals in snapshots, not predictions. I’d caution against extrapolating anything from his polls, as with any polls. I’ve included only the top three parties, as both the Lib Dems and Plaid Cymru have consistently scored very low numbers throughout this period (around 6% and 12% respectively). You can see that the two biggest parties have edged up slightly, while Ukip have slipped. But as with Scotland, so it is with Wales: its electorate is not a homogenous mass, and 40% of them will not vote Labour in every constituency. 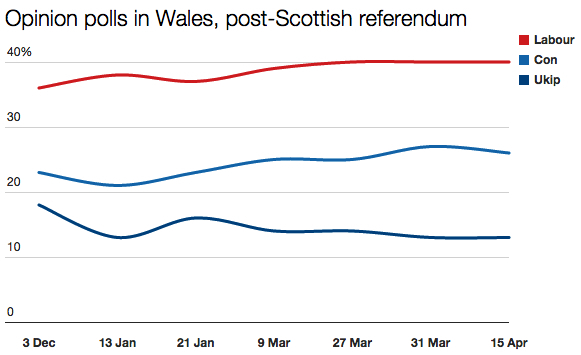 I know Scotland v Wales is not a like-for-like comparison, but that’s precisely the point. Very little can be presumed about almost everything in this election, Scotland included. There may be a fair number of Labour MPs in Scotland come 8 May. Then again there may be hardly any. We just don’t know. If we did, there’d be no point holding the election. Labour in Scotland needs to run a highly localised campaign centred on the seats it can feasibly hang on to. Unfortunately for them, these are exactly the same seats where there is no campaigning infrastructure because big Labour majorities have been taken for granted for so long. Apart from Scottish and Scottish Constituency Ashcroft Polling and the referendum result, I think it is reasonable to look at Holyrood 2011 constituency results as that was the first election in which SNP really managed to eat in to the Labour vote. The worst result for Labour (which I think is a possibility) is for them to hold just 3 seats: Coatbridge C&B Edinburgh S and Kirkcaldy&Cowdenbeath. However I agree they hold as many as 8. Incidentally I think Additional Member System used at Holyrood and Cardiff Bay and also used in Germany and New Zealand is a very good electoral system as it is proportional but does not preclude the possibility of a government with a small majority as happened to SNP in 2011. 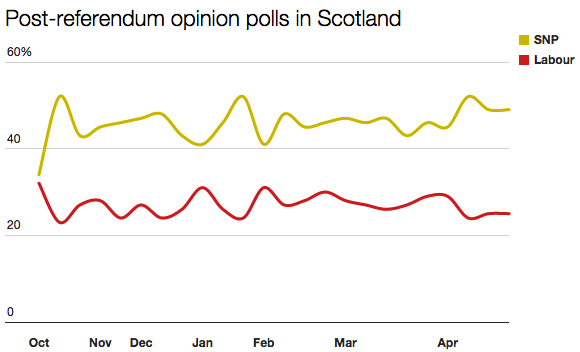 Yes, the SNP vote will be spread unevenly. The bad news for Labour (and the LDs) is that it will be spread efficiently – high in Yes areas with a one/two-party system (e.g. Glasgow) and lower but probably still sufficient in No areas with a multi party system (e.g. Edinburgh). 50 looks par from here, with the Unionists holding between 1-3 each. A late swing is unlikely to materialise given the solidity of the SNP vote in polls; all that is left is pollster error (quite possible there are shy Unionists), differential turnout (will these newly-registereds make it to the polling booth) or tactical voting. Sorry Ian, your prediction back at the beginning of the new year has been shown to be out of Kilter with increasing support for the SNP. A continued defence of your earlier forecast cannot be defended in face of current polls. I’m not defending my earlier forecast – that’s why I’ve done several fresh forecasts since January! Will turnout be up or down?